Lexus introduced the SC shortly in 1991. Initially, the Lexus SC was only available with either an eight (SC 400) or six (SC 300) cylinder engine. 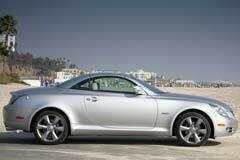 However, even after this luxury automaker launched the SC coupe; it still lacked a convertible model. This gap was eventually filled with the introduction of the Lexus SC 430. It was among the first luxury convertibles to incorporate a retractable hardtop in its exterior design. The Lexus SC 430 was in production from the year 2002 to 2010, and it underwent very minor changes throughout this period. Despite the fact that it may have the look and feel of a sports car; the SC is essentially an amenity packed luxury tourer. With Items like a navigation system, authentic wood trim, leather upholstery, and a 4.3 liter V8 engine, the used Lexus SC is definitely a good feature packed luxury vehicle that is ideal for all types of drivers.